I can't speak to that warranty, no personal experience or knowledge. It's exclusionary, which is good. Follow sidemarker's advice and do some research with a few dealers, google the company, etc. The one thing I can tell you is that if you plan to keep the car and buy a warranty, get it now, don't wait. I have a folder in my email application named "OhNo" filled with horror stories from people that waited and suffered an expensive failure without coverage, waited and price went up a lot, waited and warranty company no longer offered coverage for their car, etc. Waiting is rarely a smart move IF you know you plan to keep the car AND you know you intend to buy a warranty. Being that the M5 (2008 with 30k) is my summer only car and I split the summer traveling between that and my bike I am seriously thinking about NOT getting a warranty. I will probably only put 5k miles on it a year MAX. I just don't see a ROI with getting a warranty. I figure I'll probably be better off saving that $ and repair as I go. Comments on this approach?? There is abolsultely no repairs that have been needed up to this point. Just regular oil changes, cabin filter changes, brake fluid changes, etc all done under the Maintence plan that is now expired. I am about to pick up an 08 M5, approximate mileage is 42000... from what the seller tells me I still have until March of 2013 on the maintenance plan with BMW but the warranty itself just recently expired. Will it be difficult to extend the factory warranty or maintenance plan or will I have to go with something aftermarket? Also, does anybody have a ballpark figure what purchasing one will be? I read through the thread and did notice that several individuals said that prices have risen dramatically for coverage on this car; however, before I decided to purchase the car I decided that I wouldnt own one without coverage. That being said, this is my first post. Even before asking around about mods! I got a 07 @ 58k with a 2 year bmw powertrain plus. Warranty for about 3400. Should I keep it or cancel and possibly find something better? My advice would be to cancel and get something else (preferably from me!). That coverage is so limited, if you start having problems, unless you blow the motor, you'll be paying for most things yourself. I can get you two years of exclusionary coverage (including SMG Pump), which includes almost everything on and in the car, for not much more money than what you paid for two years of powetrain-only coverage. There's no comparison. I can help get you coverage. I can't speak to what BMW can offer for an extended warranty, but I can get you into an excellent exclusionary plan, usually for less than BMW charges. Email me for more info, include ytour VIN# and odometer reading. 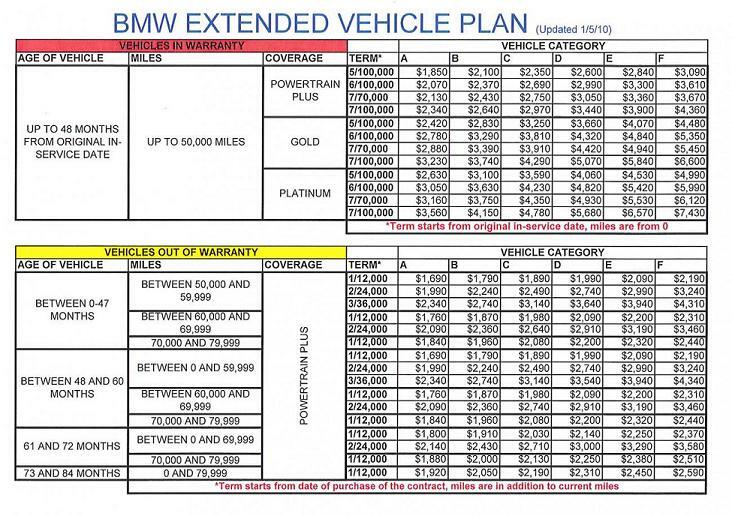 For those who have questions about BMW's extended warranty plans, they have different coverage levels based off if your car is, or is out of the original warranty period (4 yrs/50K miles). **I have BMW's extended warranty Platinum level, which is their top tier coverage. So far it's paid for replacing the SMG clutch position sensor, front bushings, and some other items. **I paid $4991 for an additional two years / up to 100K miles. **The advantage is that it's a BMW backed warranty, works at every BMW dealer, and there shouldn't be any arbitration (none that I've experience at least). The disadvantage is that it is only honored at BMW dealerships and does not allow you the flexibility to take your car to an Indy shop. 3rd Party warranties are more flexible and if your Indy shop accepts the insurer, you can take it to places of your choosing, including BMW dealerships. However, depending on the warranty company, they may have to have a claims adjuster come visit and the process can be a bit long (so I've heard and seen people gripe about on this board). More often than not, it's just a quick phone call from your Service Dept to the insurer. Each level provides varying coverage, the platinum being the most comprehensive. However, none are all inclusive as the original 4 yr/50k warranty. Powertrain is minimal, covering major mechanical components, and is pretty much the equivalent to BMW's CPO program (so I've been told). That said, Platinum is an exclusionary warranty and items that are not covered are listed in the contract. Warranty booklet and sample contracts are attached in PDF form. Prices vary from dealer to dealer. Each dealer tries to mark up the warranty costs. The best thing to do is shop around and pit dealers against each other to drive costs down. Last edited by mdyaman; 24th November 2012 at 09:52 PM. Bruce, as soon as I take delivery of the car I will send you an email with that information. Thank you for your help.